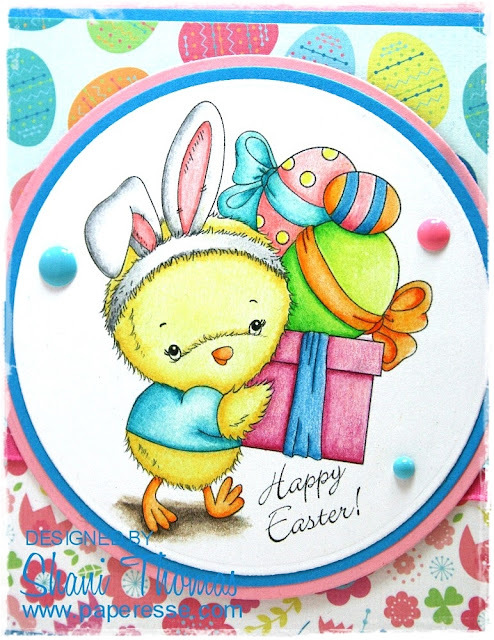 An Easter card for you today, featuring Di's Digi Stamps The Ears Are the Best Bit digital stamp (retired). I like Di's stamps. You know how sometimes you have a stamp company that no matter what their stamps seem to turn out right for you? That's Di's Digi Stamps for me (like this fav Easter card from last year ). The digital papers on this card are freebies from Crafts Beautiful magazine. The sentiment was created with Bickley Script font. Embellishments are ribbon and enamel dots. I'm linking up with: Moving Along With the Times #67 – Easter, Daring Cardmakers 16/03/18 – Watch the Birdie, Colour Crazy Challenge Week 11 – ATG, My Time to Craft #366 – Easter/Spring, and Crafting with Dragonflies #100 – Easter cards. 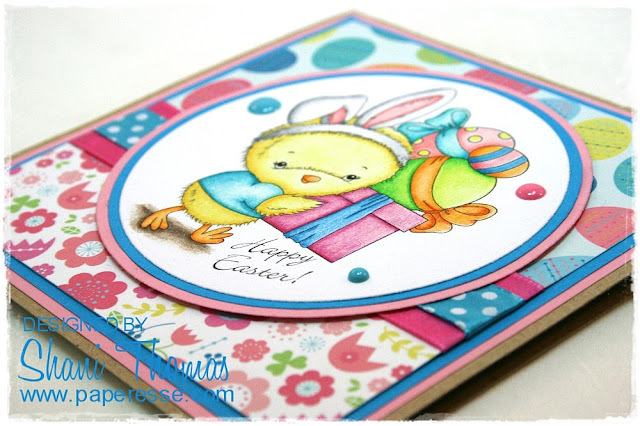 Lovely Easter card with a sweet image and beautiful colours, thanks for sharing at MTTC this week. Eye popping colors!! Absolutely love your palette and the super & masterful pencil technique! The freebie background papers are a perfect choice for this image. Delightful card my friend! Cute image. Great coloring. The egg paper is perfect with the image. What a sweet image! Great colouring and the papers are perfect. Thanks for joining us at Daring Cardmakers this week! Il est très chou ce poussin déguisé en lapin!! L'image est très belle Shani et le papiers sont gais et très printaniers!! Voilà une jolie carte de pâques!